Sometimes travel agent Fam trips are so cruel. You dash around from place to place and oftentimes from hotel to hotel. The idea is to get an overview of the destination—enough information for you to speak intelligently and knowledgably with your clients—but often not really enough time to appreciate, experience, relate, and really embrace a destination. In a sense it’s a teaser. Here is a taste and if you want more, come back and visit us. And so began our 85 minute odyssey in Huanchaco. We were on one of the post event Fams associated with ASTA’s International Destination Expo in Lima, Peru. The Fam featured “Northern Kingdoms” and included visits to key archeological sites and museums in the area of Chiclayo, 770 km north of Lima, followed by an almost four-hour coach trip south to the city of Trujillo for more sites, including the UNESCO World Heritage city of Chan Chan. The morning was spent exploring the fascinating ruins and colourful wall paintings and symbols of the Huaca del Sol. Huaca refers to a sacred place, so this venue, one of the largest adobe structures in the Americas and dating back to the pre-Inca Mochi culture of around 500 C.E, is often referred to as the Temple of Sun. The nearby Huaca de la Luna is still being excavated and is not accessible but watching the archeological teams digging and carting sand away in wheel barrows, framed against the huge pyramid of the Huaca, was a scene straight out of an Indiana Jones movie, but of course this was the real deal. After visiting the impressive museum and then walking, climbing and clambering around the actual Temple of the Sun in 30C heat, we were ready to head to our lunch stop before visiting Chan Chan later in the afternoon. And lunch would be at Huanchaco. The once tiny fishing village of Huanchaco lies 12 km west of Trujillo and is now considered one of the prime beach resorts in the area. A sign pointing to the Playa el Varadero revealed a small strip of beach, plastered in beach chairs and umbrellas. And leaning against the wall that separates the roadway from the beach were the famous caballitos del mar, the ‘horses of the sea’ which are in fact tortora reed boats that fishermen have used in the area for 2500 years. We had a ten minute bus tour of the main street and a side street --which led back to the main street-- and then were loaded into the Huanchaco Beach Restaurant for lunch. “You have one hour before we head to Chan Chan and then we are taking you to the airport for your flights back to Lima”. Chan Chan was definitely on my ‘must see’ list and the flight back to Lima was equally important as we were flying home to Canada the next day. So we sat down at the long group tour table, which had been set up as the long end of a T against the 2nd floor open windows, and prepared to eat and only watch the beach life, and use our zoom lenses to see the famous fishing boats. One of the features of Peruvian cuisine is ceviche. The dish consists of raw fish, marinated in the juice of lemons, limes and sometimes sour orange, all of which imparts a wonderful citrus aroma and taste to the fish. Other ingredients, such as onions, cayenne pepper, hot pepper, garlic, parsley and cilantro are often added in various amounts to complement the dish. For those who love fish, this is taste bud heaven. Snapper is often used, as is tilapia, shrimp, calamari and octopus. And there are variations on the theme, so for instance Pulpo al Olivo consists of octopus, black olives and a mayonnaise-like dressing. The thick grey sauce does not look very appetizing but the olive-tapenade taste is wonderful. And of course either a nice cold Cusquena Beer or a glass of Peruvian Malbec (Intipalka is quite good) completes the meal. So, being at a beach resort, the restaurant started bringing out the ceviche dishes. Many of the travel agents were already declaring that there was no way there were going to eat raw, marinated fish but hunger seemed to give way to caution as they dived in when the dishes were served and only asked what it was that they had eaten, afterward. So my colleague and I looked at our watches and it was 1:25 pm and the ceviche and bread and salads were still coming out of the kitchen. But the sun was shining and the small beach area, as well as the jetty jutting into the Pacific Ocean, were becoming more crowded and, well, the call to explore for some of us takes precedence over the need for lengthy group meals, so we paid for our drinks, agreed to meet the bus at the appointed time, and dashed out. With so much being made about the reed boats we felt that any visit to Huanchaco without at least seeing them up close was a crime, so we headed over to Varadero Beach to see the Caballitos all lined up. Tortora reeds are the same vegetation that grows on Lake Titicaca and the large floating rafts and houses on the Lake are made of layers of the reeds. 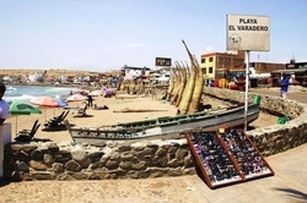 Here in Huanchaco, fishermen bundle the reeds together to create cigar-shaped boats, tapered at each end. Sitting or kneeling on one knee in the stern of the boat, the fishermen use the surf (and yes, surfing is very big in Huanchaco), to help inspire rapid movement of the boats as they throw out their nets in the early morning to bring in a bounty of fish for the locals, as well as the restaurants and hotels on the main strip. And now with 15 minutes remaining, we checked out the jetty but decided not to pay the 20 cent admission only to run to the end and back, as time was running out. Instead, we explored some of the surfing shops and restaurants, and if there were a few precious minutes left, we wanted to just sit, watch, reflect and contemplate the colourful Huanchaco local buses passing by, listen to the calls of restaurateurs beseeching us to try out their establishment for our next meal, and revel in the sunshine and ambiance of a very small but unique destination. At 1:05 pm, some of the travel agents left the restaurant after dessert had been served, and walked across the street to join us. And by 1:15 we were on the coach heading off to Chan Chan. Our 85 Minutes in Huanchaco left a very pleasant memory of a place I would not hesitate to return to, and would most likely spend at least one night there if the occasion presented itself. We used our time to explore the town and the beach, to pick up some local flavour by chatting with the vendors; we got up close and personal with the caballitos, and of course we had the opportunity to savour the flavour of unbelievably fresh ceviche, the local specialty. While the fam trippers were treated to coffee and desserts, we found our own sweet way to end our meal, and that was through the wonders of interaction and discovery.